The church is no longer used for worship in 2017, but has been re-purposed as the "Garden and Wedding Center"
The original 1847 Nenno church and school, as it appeared about 1950. 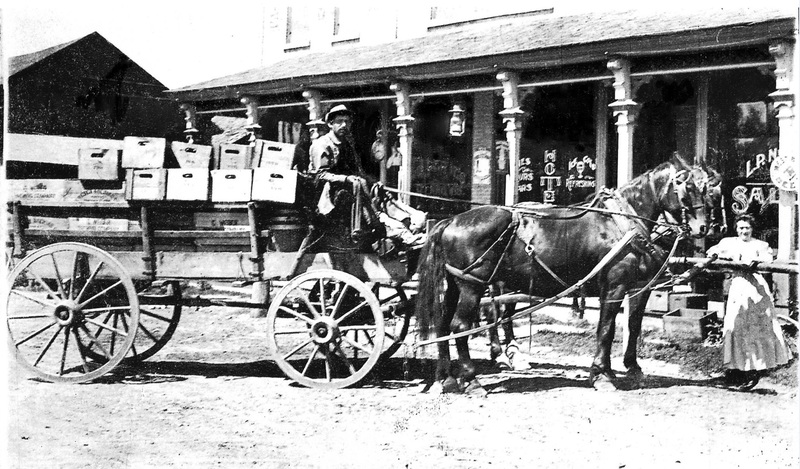 General store as it appeared about 1900, across Hy 175 from St. Peter and Paul Church in Nenno, Wis. Built by Nicholas Nenno about 1870. After his death in 1877, owned by L.R. Neuburg at least until the photo below. 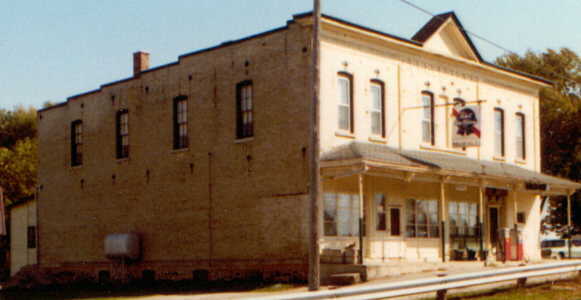 The Nenno general store as it appeared about 1980. Bonlender Blacksmith Shop as it was in 1979 in Nenno, Wis.
On the plat map of 1859, it can be seen that Nick Nenno owned a 60-acre parcel of land - its description being the SE¼ of NE¼ of section 7 of the Town of Addison - also the S½ of the NE¼ of the NE¼ of section 7. 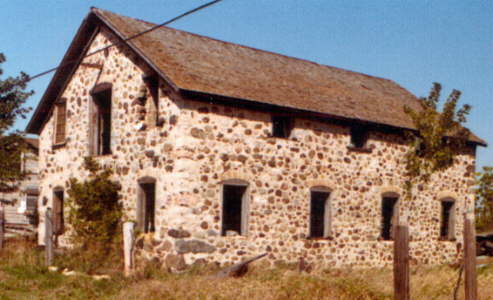 Placing it on our today's map, this was the former Jerome Mueller farm, now Harold Mueller's second farm. Later, Mr. Nenno sold this parcel of land to the Peter Christnacht family as shown on an 1873 map. The Christnacht family descendants later became the Allenton bank family. 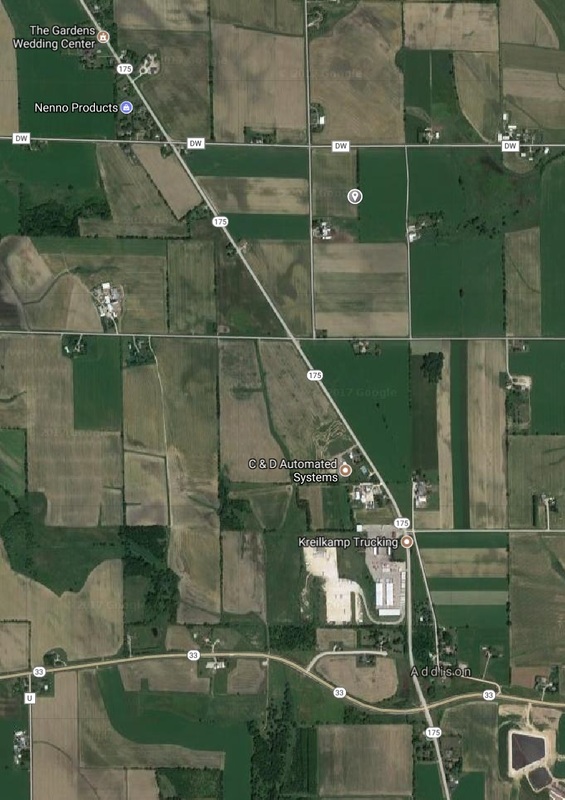 Mr. Nenno then acquired approximately 5 acres to the immediate east of SS. 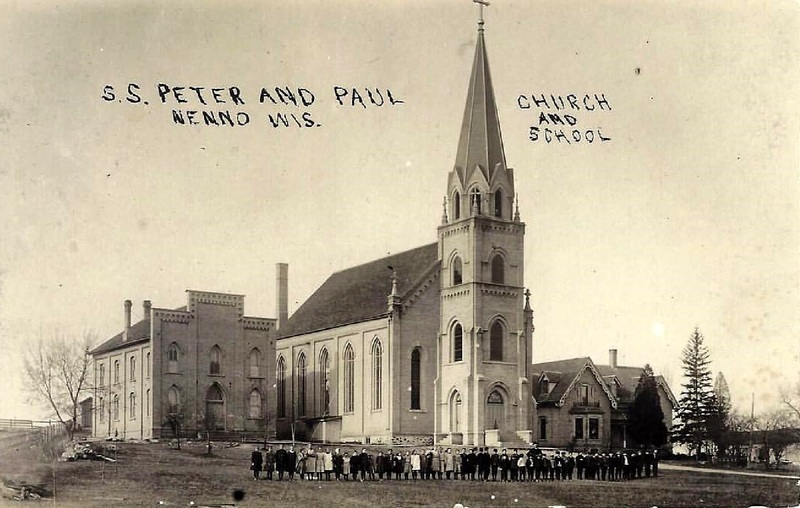 Peter and Paul Church, where he built a store, hotel and post office. It is today (=1976) the Alois Neuburg property, without, of course, the post office, although some evidence of post office essentials and artifacts can still be seen there. Mr. Neuburg did say that their park to the south of the tavern was church property which was purchased. 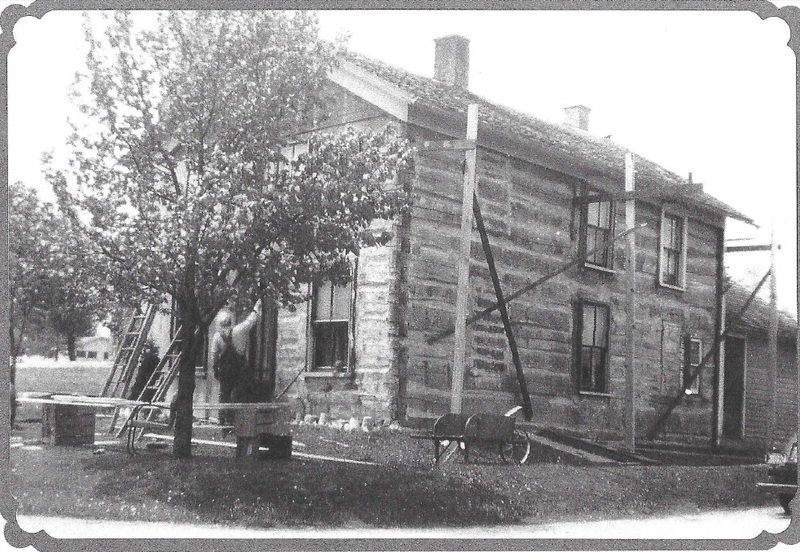 Vintage pictures of the Joe Mueller barn, the post office, and the Bonlender Blacksmith shop are inserted. Mr. Nenno also built a large shed to the north of the store which had its south side open. It was used as a horse stable for SS. Peter and Paul church attendants, shoppers at the store, as well as travelers staying at the hotel. They would tie their horses into this building for protection from the elements, especially in the winter, when the owners would cover them with blankets to keep them warm. As to Mr. Nenno's descendents, it was found that several distantly but directly related are living in Beaver Dam. It was learned that his daughter-in-law and his grandson are supposedly buried in SS. Peter and Paul cemetery. 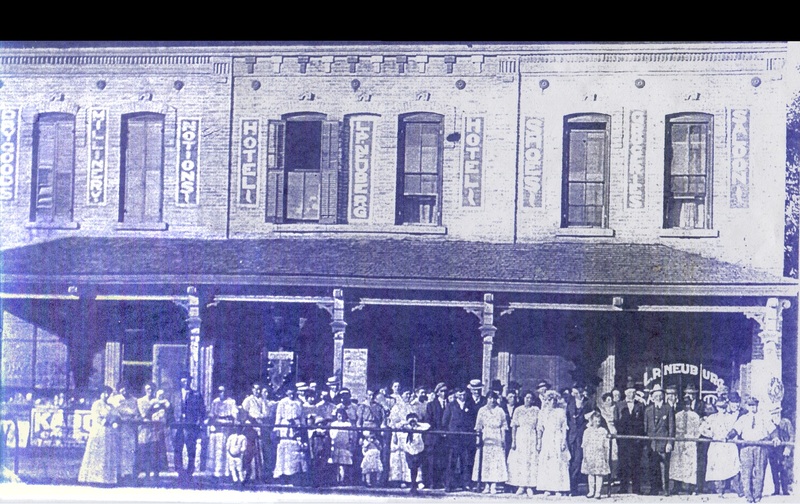 On a map of 1873, we learn that a Mr. Michael Gehl and wife Theresa from Luxemberg, Germany, had somewhere along acquired the Nick Nenno hotel and store. There was a creamery built near the store. The farmers in the surrounding area who had milk cows, usually had a machine called a cream separator, which separated the cream from the milk. 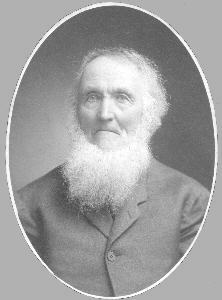 Ambrose Zingsheim, who raised 13 children on a 40-acre farm, and who lived on the former Wendolyn Zingsheim farm, drove to the farmers' homes with horses and a small wagon to pick up the cream and hauled it to the Gehl creamery. Whenever a farmer didn't have a cream separator, he himself, with a scoop, took the cream off the milk as best he could. The cream was made into butter and cheese which was hauled and sold to other communities. Because no cream was picked up from the farmers on Sundays, they had to make use of the cream themselves, making it into butter, cooked and cottage cheese and even brick cheese. Today the store and tavern are operated by Weise and Eleanor Neuburg, and are helped by their three sons John, Bertie, and Charlie. The remaining 12 paragraphs on the article are omitted. They do not appear to relate to the Nenno family, but rather to contributions of other families. However, it is mentioned that an artist "Mr. Nennig" came to Nenno from Theresa in the very early 1900's, leaving behind much art and 12 children. 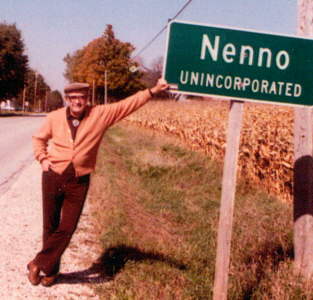 In June 2001, the Nenno Brewery still stands and is a thriving bed-and-breakfast.